Disclaimer: I received a complimentary copy of this book from The Little Brown Book Group UK via NetGalley in exchange for an honest review. "Beyond the window was the parking lot and beyond that the desert, and beyond that the sky, mostly void, partially stars. Layered from her vantage, it was all distance, equally unreachable from her post at the counter." 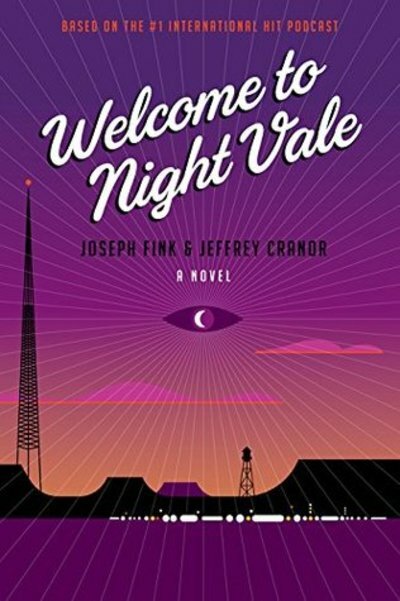 This debut novel by Joseph Fink and Jeffrey Cranor is based on the hit podcast Welcome to Nightvale. If you're a fan of the podcast you'll have a pretty good idea what to expect, and like me you will probably hear Cecil (the voice of Nightvale Community Radio) narrating the book in your head. If you haven't listened to the show (and you totally should, it's free and awesome) this novel should still make sense to you, at least in so far as it makes sense to anyone. It's the story of young Jackie Fierro, who runs the only pawnshop in the desert town of of Nightvale, and has been nineteen years old for as long as she can remember, and Diane, office worker and single mother to a morose teenage son who constantly shapeshifts into different forms. Jackie is given a piece of paper she can't get rid of by a man in a tan jacket whose face she can't remember.Together the two women set out to find out where the mysterious man came from and why he seems to be carrying a suitcase full of flies. Fans of the podcast might be bothered by the fact that Cecil isn't really in the book much, though it features cameos from various popular characters like Dana, the mayor, the faceless old woman who secretly lives in your home, Carlos the scientist and Cecil's brother-in-law Steve Carlsberg (ugh, Steve). However, I found Jackie and Diane (saying their names like that keeps putting that John Cougar Mellencamp song in my head) had interesting story arcs that held my attention. The book is partly about family, specifically absentee fathers and the relationship between mothers and their children on the verge of adulthood. This book is very surreal, sometimes a little scary and at other times hilariously funny, punctuated with moments that are genuinely profound. It will probably appeal most to fans of the podcast, but it's worth a look even if you're not yet a fan.